You are here: Home › approaches to teaching › learner profile › Are field trips the ultimate test of student agency? What attitudes will students show outside of school? Will their actions be principled and respectful? Will their communication be empathetic and open-minded? Will we see them be agents for their own learning? Will we see them be agents for change and a better world? Agency could be partly defined as the ability to first of all take care of oneself. Field trips like ours mean that students have to develop independence to take care of themselves. This includes cleaning shared spaces, maintaining personal hygiene, making decisions about appropriate food to eat, making agreements with others about taking turns in the shower, and showing tolerance and patience towards friends and teachers. Through their own inquiries students also learn a lot from the people who work in the hotel about how to organize their belongings, make their beds and how to prepare some recipes. For many of our students, this is the first time that they have been away from home and their families. It is also a very intense three days of activities such as hiking, learning to do local crafts and visiting historic landmarks. Students get tired. It provides the ideal moment to talk about the importance of self-motivation and what success means for different people in the group. 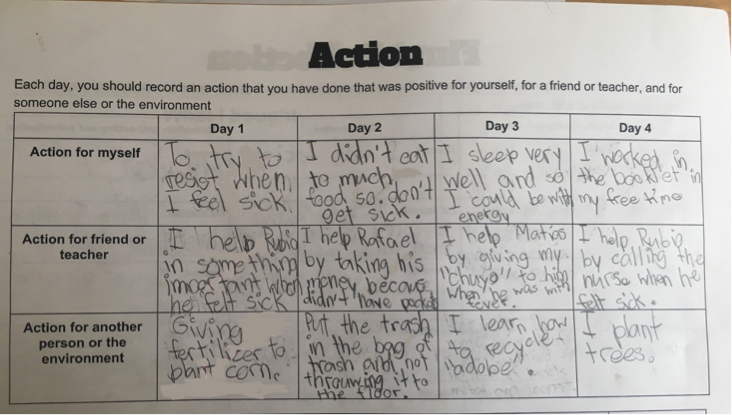 We have found another way to focus on agency is to have students keep a log of actions that they have done each day – something for themselves, something for another person in our group and something for someone outside of the group or the environment. 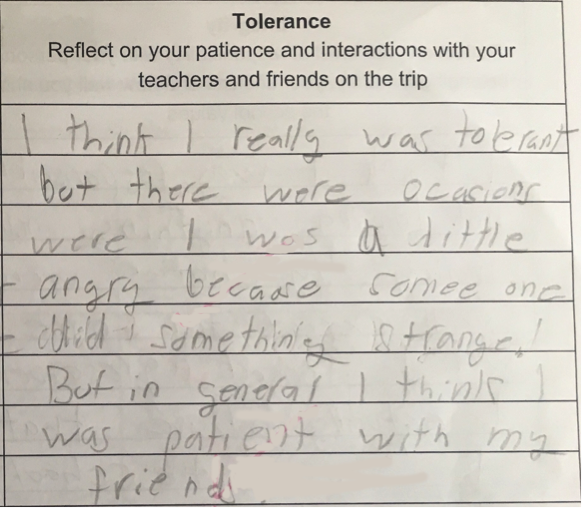 We found that students made a great effort to be kind to each other and that this kindness extends beyond our community to others who we meet on the trip. 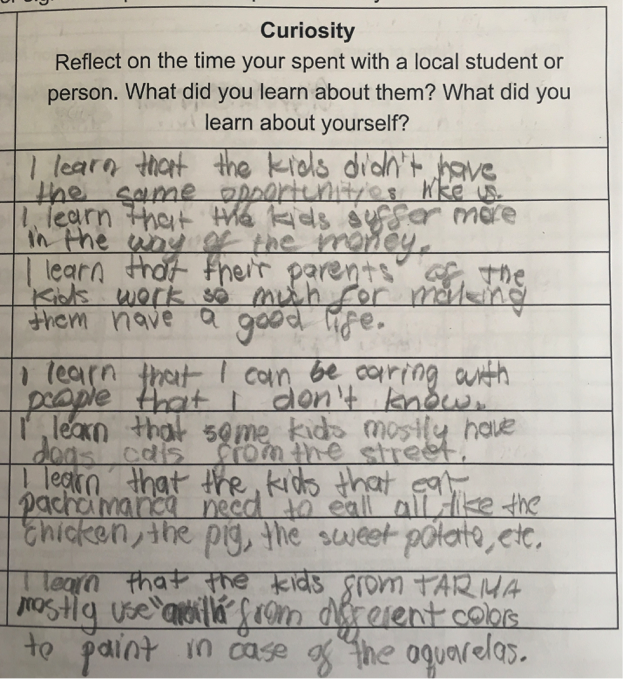 Guided reflection related to specific attributes of the IB learner profile is also a way to foster greater agency. 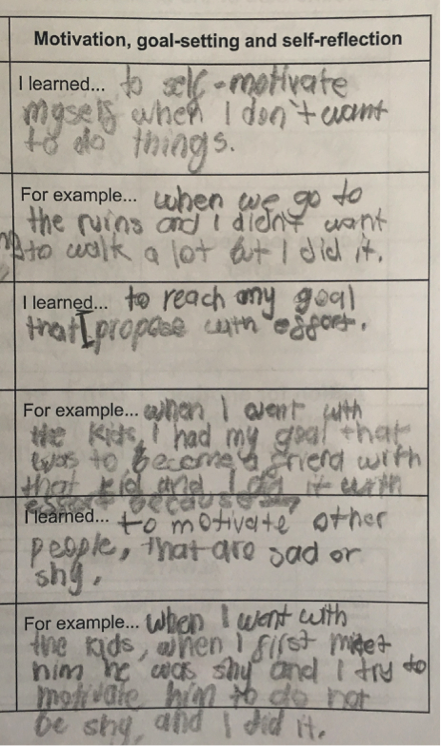 Giving students the opportunity to reflect each day on ways that they have shown different attributes raises awareness of the importance of being confident, respectful and committed. The field trip is an ideal moment for students to try out their questioning skills and find out about their interests. They are encouraged to ask the perspectives of the people who live in the cities we visit, the authorities and other people that they meet. All this leads to self-directed learning in their areas of interest. One of the most significant activities that we do on this trip is to spend time with children in a local school in need of support and resources. During this visit, friendships are formed as children have the opportunity to create an art project together and share their appreciation for the beautiful country we live in. On their return to school, this year many of our students have selected to work on the challenges with education, nutrition and poverty as part of their exhibition projects. Their action will reconnect them with the students and school that they visited during the trip in order to organize collections, donations and a further visit to help their new friends. Field trips are the ultimate test of student agency, because—if focused correctly—they provide opportunities for students to show themselves as agents in the real world. When taken out of the academic environment, young people can surprise us by showing they can be agents for themselves, agents for their friends and agents for action in the wider world. Today in the national school we visited I met a boy. His name was Darci. He came up to me and asked me, “Would you like a Fruna (candy)?” I told him yes, and invited him to paint with me. 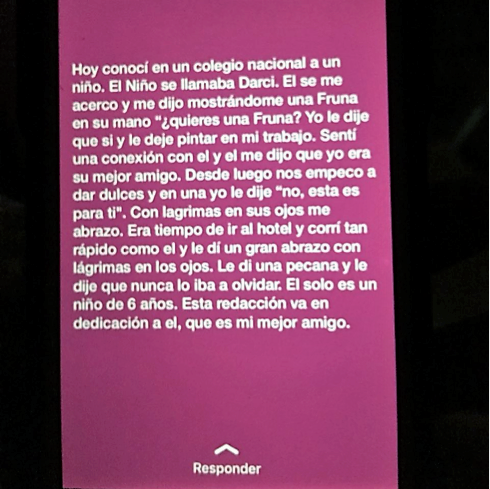 I felt a connection with him and he told me that I was his best friend. After we finished painting we started to give out some sweets and I said to him, “This is for you.” With tears in his eyes he hugged me. It was time for us to go back to our hotel, I ran really quickly like him and I gave him a big hug with tears in my eyes. I gave him a pecan and told him I would never forget him. He is just a kid of 6 years old. This reflection I dedicate to him, my best friend. 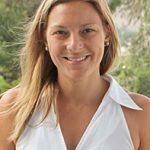 Kathryn Rymarz is Deputy Head of Lower School and PYP Coordinator at Newton College in Lima, Peru. She is an IB Workshop Leader and School Reviewer for IB Americas. She has worked in international teaching for 12 years and holds a Masters Degree in Instructional Science and School Leadership from Drexel University, PA. You can follow her on Twitter @KatRz7. 7 Responses to Are field trips the ultimate test of student agency? Hi Jorge, could you let me know what exactly are you referring to? Our students follow a bilingual programme and we give them the flexibility to write in English or Spanish, although by grade 5 we do encourage them to work where possible in English to better develop the additional language. Thanks for the comment, Kath! I really like the idea of having students a part of organising the trips themselves as they do this in the Exhibition project but I think it would be great to try and foster thinking about this before that – even in the grades before. Many thanks again! Great idea to have students plan and organize their field trips. Loved the established, explicit connection between ‘self-care’ and ‘student agency’. Great idea to involve students in planning and organizing their field trips! Loved the established, explicit connection between student agency and self-care. Your post lights me up with ideas for engaging students in a fun way to learn agency: Field trips! I’m curious which skills of agency were focused on and built prior to the overnight field trip? Thank you for this. I appreciate the question your title elicits, and look forward to hearing back. Leave a Reply to Kath Click here to cancel reply.